This topic contains 40 replies, has 5 voices, and was last updated by Christina Chester 4 years, 5 months ago. 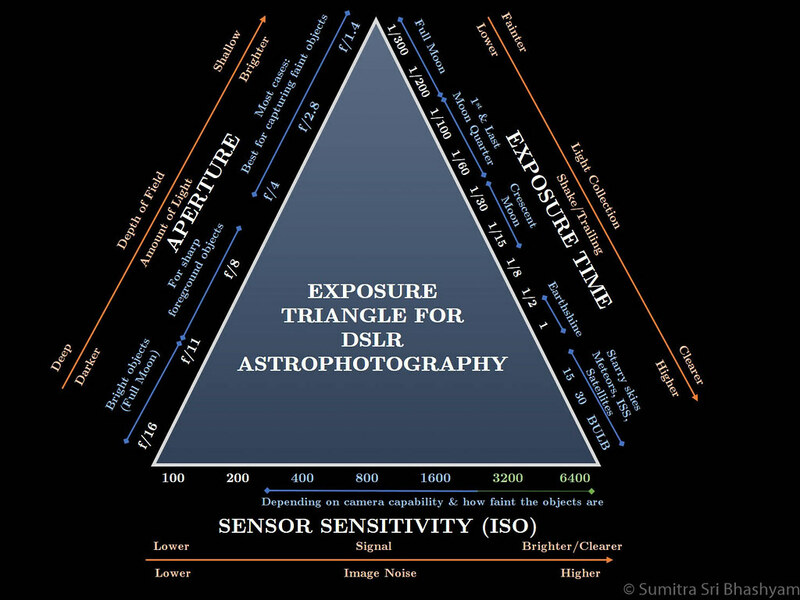 I’m working on some slides for the camera club and created this exposure triangle for astrophotography. I know it is perhaps a little too cluttered but I thought all the information would be useful for people who are not familiar with astrophotography. Perhaps I could create a ‘lite’ version with less info that would be more suitable for Flamsteed members? What do you think? Feedback welcome! Nice idea, I think this could work rather well. You should make it clear that you’re referring to DSLR photography. For ISO, I wouldn’t necessarily discount high ISOs in light polluted skies… in fact, quite the opposite… you’d adjust the exposure time accordingly. Aperture. Not sure if you want to mention “stopping down” by a stop or two to sharpen the image and get rid of coma and other aberrations in the corners of the image. Hi Mike, Glad you like it!! And thanks for the feedback that follows, I shall try to implement later today. I didn’t think of including times for the Moon – very good point and will try to include as neatly as I can. I’ll post another version later! So I’ve updated with Mike’s comments – I hope I captured all well enough. ISO: Is this ok now? For the Aperture, I tried to put the extra bit you suggested but I found no place to fit it in 🙁 I think I can mention in another slide. If you have other feedback, let me know! Also, you find this is a good resource for Flamsteed users, I’m happy for it to be put somewhere on the website. Like it…. except for the typo in the middle (should be DSLR!). Will certainly put it in useful links. Thanks for spotting that! 🙂 Rectifying it now! Now it’s all clear, no one has any excuses not to go out there and taking some photos!! GO GO GO everyone!! This is a nice idea which I can see you have put a lot of work into but I don’t think you can make it this simple. Wide apertures cause problems. High ISO always causes problems. Maybe a colour code to suggest ‘risk of artifact’ on the line with wide apertures / high ISO ? Thanks for having a look and for the feedback. I do appreciate that there are so many more things that need to be included, but I wanted to make a sort of rough guide for people to start getting their hands on doing a bit of astrophotography without intimidating them further. Having spoken to many experienced photographers (some professional) at the club, I realised that they have never tried because they think they cannot do any of it despite having all the equipment they need, some with much better cameras than I had when I started and because they do not know where to start. What do you think if I included this information with the other information Mike suggested above (re the aperture) on a separate slide? I fear that these grand technical words might sound scary and stop them from trying out…? Alternatively, I could create a more advanced triangle where I would not include the more basic information and include this more technical stuff? I meant to say that with a higher ISO you can collect more signal and the stars will appear brighter. Perhaps there is a better wording? Nice graphic Sumitra! I would love a copy of this as it’s great to have all this useful info in one easy to grab place! Must say, I also was a little confused by the sensor signal part… Perhaps it’s just the word ‘signal?’ Clarity/detail, is that what you mean? In my experience many amateur (and professional) photographers never think to look up for their subject matter. If they did they would never be short of things to photograph! – with camera lenses, they are not good at resolving point sources of light like stars. Therefore as attractive as it is to use the lower f ratio of a camera lens, it causes to aberrations that become more visible with long exposures. – with high ISO, all this is in a digital camera is amplify the signal captured by each pixel. Its not like film which was more sensitive although ironical exhibits the same problems. Amplification adds noise and long exposures just make this more visible, plus it amplifies light pollution making that more obvious. A high ISO shot in daylight looks OK, but at night its quite obvious. With the colour coding, what I was thinking is that you just have a key that was better / worse in maybe green / red. However I accept that this may lead people to think there is an ideal setting which of course there isn’t. Your comment about high ISO is not correct. If you increase ISO and keep exposure the same, then yes you would reveal more information, but if done in the day you would be overexposing. You still need to look at the histogram to decide what is the correct exposure. I would limit ISO in London to 1250 and 1600 in a dark area. I then look at the histogram for a peak about 1/3 from the left. When I get there that’s my general exposure. However as with daytime some objects need you to bracket. Thanks for all the feedback, it’s much appreciated and very useful. I hope I don’t sound ungrateful, but I just do not know how to ‘display’ all this information into this diagram. Could I clarify a few points, as I am not sure I understood everything? – Your First point: Perhaps I can add more/less aberration on the axis above Aperture? – Your second point: this is what I was trying to convey… do you think it requires improvement, if so could you suggest wording on the axes? – Last point: I am not sure about what you mean in the last point. As I drew this Triangle specifically for night time photography I made the assumption you would not be overexposing because of a daylight sky. I put a range of ‘suggested’ ISO’s that I meant as a guidance to investigate the correct exposure (which would be narrowed down using the histogram as you say). Again, I just want to say that this is really a very rough guide that could serve as a starting point for complete beginners who are not sure where to start. I’d be delighted to draw a different triangle with more specific guidance, say a Level 2 triangle. What do you think? Don’t be silly, I am perhaps over analysing it anyway! Your First point: Perhaps I can add more/less aberration on the axis above Aperture? For Astrophotography we are dealing with infinity focus. If you were taking a landscape that included a foreground object, then obviously you would need to use a small aperture to increase depth of field. However this leads to needing a longer exposure which may cause trailing. Without the foreground interest we just need as much light as possible. For me that means going a couple of stops down from the max aperture to avoid lens trouble. Your second point: this is what I was trying to convey… do you think it requires improvement, if so could you suggest wording on the axes? Personally for long exposure astrophotgraphy I think high ISO is just a no no. Sensors may one day change this but not yet. I think its more appropriate to limit it to ISO1600 and maybe use a dark sky / bright (polluted) sky as the guide for it rather than suggest it as a means to capture more light. Last point: I am not sure about what you mean in the last point. As I drew this Triangle specifically for night time photography I made the assumption you would not be overexposing because of a daylight sky. I put a range of ‘suggested’ ISO’s that I meant as a guidance to investigate the correct exposure (which would be narrowed down using the histogram as you say). What I was trying to say was that if someone has decided that 15 seconds / F4 and ISO 1000 is correct, keeping light pollution under control, then upping the ISO to 1600 or more might capture some more detail but will burn out some star colour and may also make light pollution more noticeable. So it reveals more stars but overexposes others. That then is very difficult to correct in processing. Generally I like what you have done. I just think for beginners you have to steer them away from simple things which cause trouble. The normal approach for many is wide aperture, high ISO and long exposure which ends in disappointment. This reply was modified 4 years, 6 months ago by Mike Meynell. Firstly, the type of astrophotography that this triangle is referring to is probably best called “wide-angle astrophotography”. It’s not just about taking photos of the night sky… it’s also about putting the sky into the context of the landscape. In that case, I think the adjustment of aperture is key, as you want to have a choice over depth of field, and also make use of certain optical effects (like diffraction spikes) in certain scenarios. I agree that a wide open aperture does cause issues, which is why Sumitra’s idea for a second slide is a good one… but you don’t want to put too much information in this overview slide, as it’s meant for beginners so that they get an idea of the camera settings that they may want to use. That said, I’ve taken perfectly usable images at f/1.4, and have just accepted the aberrations at the corners of the image (sometimes cropping them), or the relative overall softness, as that is the effect that I wanted to achieve. As long as you know the consequences of choosing a wide-open aperture, you can work within the constraints. I must disagree with the high ISO comment for astrophotography. Surely it depends on the camera? We want to shoot at the highest ISO possible without getting too much noise in the image. For my 5D mark II, I know that this is around ISO 3200 and 6400. For the 60D, it’s around 1600 to 3200. If I had a Sony A7S (starts hyperventilating), I have seen usable images without noise at ISO 51,200!! Quite extraordinary. Also, Sumitra demonstrated recently how ETTR techniques can reduce noise in the image. As a rough guide, I think the triangle works well.